Lottoland has announced it is expanding its financial services after it received a full insurance licence from the Gibraltar Financial Services Commission (FSC). The company, which is based in Gibraltar and has subsidiaries all around the world including Lottoland Australia, received the licence under EU insurance legislation. The licence is for its newly established Fortuna Insurance company, which will consist of five experts who will provide in-depth information on insurance and reinsurance, financial markets, regulatory issues, and gaming analysis to the company. The bookmaker, which takes insurance out to give players the chance to win the equivalent jackpot to international and domestic lotteries, said it is the first and only company in the gambling industry to establish its own insurance company. “The fact that Lottoland is the first and only company in the gaming sector to have done this highlights our commitment to industry best practice and transparency,” Lottoland CEO, Nigel Birrell, said. Fortuna Insurance will be regulated by the FSC, as well the European Insurance and Occupational Pension Authority (EIOPA), ensuring the company complies with the European Solvency II regime. “This is a historic milestone for Lottoland – transforming its industry-leading risk management into its own fully authorised and licensed insurance company,” the company added in a press release. Lottoland allows players to bet on the outcome of major draws from around the world, like Powerball US and EuroMillions. Thus far, Lottoland players from all around the world have won over €900 million (more than $AUD1.3 billion), while the biggest win recorded so far is €22 million, won by a player from Berlin in 2016. The company also announced last month that it has taken out a record insurance policy with an unnamed provider, giving it €120 million (more than $AUD170 million) worth of Insurance-Linked Securities coverage which will now be handled by Fortuna Insurance. Fortuna is also expected to help serve as a marketing tool for players who don’t believe they will get paid if they land a huge win, and a way to attract other operators to team up with Lottoland. 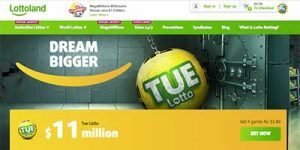 “Lottoland Solutions guarantees payouts on all winnings now through Fortuna Insurance and offers a lottery betting interface that is easy to integrate into existing websites,” the press release said. The Australian branch of the Gibraltar-based company has been under the magnifying glass for the past two months, but Mr Birrell has told the Olive Press that the attention has been good for business. Mr Birrel said the 230 employees, located in Gibraltar headquarters, won’t be impacted by any changes which occur in Australia. But the company could face state-wide bans or even nationwide prohibition given the increased attention from state and federal politicians. Victorian and Western Australian governments want to ban Lottoland, similarly to South Australia. Lottoland has countered claims that it doesn’t pay tax and recently donated $50,000 to the Royal Flying Doctor Service following questions regarding its Northern Territory licence.